San Diego U Visa Lawyer by Habib Hasbini, Attorney at Law. The U nonimmigrant status (U visa) is set aside for victims of certain crimes who have suffered mental or physical abuse and are helpful to law enforcement or government officials in the investigation or prosecution of criminal activity. Congress created the U nonimmigrant visa with the passage of the Victims of Trafficking and Violence Protection Act (including the Battered Immigrant Women?s Protection Act) in October 2000. The legislation was intended to strengthen the ability of law enforcement agencies to investigate and prosecute cases of domestic violence, sexual assault, trafficking of aliens and other crimes, while also protecting victims of crimes who have suffered substantial mental or physical abuse due to the crime and are willing to help law enforcement authorities in the investigation or prosecution of the criminal activity. The legislation also helps law enforcement agencies to better serve victims of crimes. ?You are the victim of qualifying criminal activity. ?You have suffered substantial physical or mental abuse as a result of having been a victim of criminal activity. ?You have information about the criminal activity. If you are under the age of 16 or unable to provide information due to a disability, a parent, guardian, or next friend may possess the information about the crime on your behalf (see glossary for definition of ?next friend?). ?You were helpful, are helpful, or are likely to be helpful to law enforcement in the investigation or prosecution of the crime. If you are under the age of 16 or unable to provide information due to a disability, a parent, guardian, or next friend may assist law enforcement on your behalf. ?The crime occurred in the United States or violated U.S. laws. ?You are admissible to the United States. If you are not admissible, you may apply for a waiver. ?Also includes attempt, conspiracy, or solicitation to commit any of the above and other related crimes. ?Form I-918, Supplement B, U Nonimmigrant Status Certification. The Form I-918, Supplement B, must be signed by and authorized official of the certifying law enforcement agency and the official must confirm that you were helpful, and currently being helpful, or will likely be helpful in the investigation or prosecution of the case. ?Evidence to establish each eligibility requirement – visit our Forms section, specifically the Humanitarian Benefits Based Forms. The following U Nonimmigrant information is explained in this area of the website. ?You are admissible to the United States. If you are not admissible, you may apply for a waiver on a Form I-192, Application for Advance Permission to Enter as a Nonimmigrant. ?File all the necessary forms for U nonimmigrant status with the Vermont Service Center. ?Follow all instructions that are sent from the Vermont Service Center, which will include having your fingerprints taken at the nearest U.S. Embassy or Consulate. ?If your petition is approved, you must consular process to enter the United States, which will include an interview with a consular officer at the nearest U.S. Embassy or Consulate. ?All U nonimmigrant status applications (petitions) and other forms related to the U petition are filed with the USCIS Vermont Service Center. ?All U nonimmigrant status applications (petitions) are free. You may request a fee waiver for any other form that is necessary for your U nonimmigrant status application (petition) by filing a Form I-912, Request for Fee Waiver, or by including your own written request for a fee waiver with your application or petition. ?Automatically extended upon the filing and pendency of an application for adjustment (application for a Green Card). ?The limit on the number of U visas that may be granted to principal petitioners each year is 10,000. However, there is no cap for family members deriving status from the principal applicant, such as spouses, children, or other eligible family members. ?If the cap is reached before all U nonimmigrant petitions have been adjudicated, USCIS will create a waiting list for any eligible principal or derivative petitioners that are awaiting a final decision and a U visa. Petitioners placed on the waiting list will be granted deferred action or parole and are eligible to apply for work authorization while waiting for additional U visas to become available. ?Once additional visas become available, those petitioners on the waiting list will receive their visa in the order in which their petition was received. Petitioners on the waiting list do not have to take any additional steps to request the U visa. USCIS will notify the petitioner of the approval and the accompanying U visa. ?You have not unreasonably refused to provide assistance to law enforcement since you received your U visa. ?To apply for permanent residence (a Green Card) for yourself or a qualifying family member, visit our Green Card for a U Nonimmigrant page. ?PLEASE NOTE: Any qualifying family member who does not have a derivative U visa when the principal U nonimmigrant receives a Green Card is no longer eligible for a derivative U visa, but may still be eligible to apply for lawful permanent residence. ?For information on extending your principal U visa to ensure your family member remains eligible for a U visa, please visit the T and U visa extension memorandum. 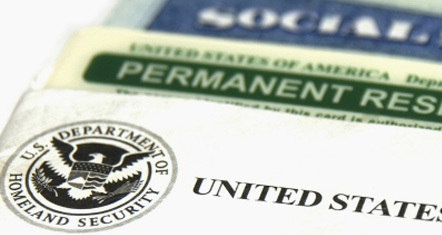 If the family member deriving status based on your status has met the eligibility requirements for a Green Card, they may apply for lawful permanent residence by filing their own Form I-485, Application to Register Permanent Residence or Adjust Status, and following the instructions on the Form I-485, Supplement E.
?First, you must file a Form I-929, Petition for Qualifying Family Member of U-1 Nonimmigrant, for each eligible family member. ?You may file the Form I-929 at the same time or after you file your Form I-485. ?Family members in the United States may file the Form I-485 to apply for a Green Card. ?Family members outside the United States must first visit a U.S. embassy or consulate to obtain their immigrant visa. Information for the local U.S. embassy or consulate and the procedures for obtaining a visa to enter the United States may be found at www.usembassy.gov. ?NOTE: The Form I-929 is the form that is used to establish whether your family member is eligible to apply for a Green Card based on your U visa based lawful permanent resident status. This does not mean that your family member will receive a Green Card. Even if the Form I-929 is approved, your family member is not automatically eligible for work authorization. They are eligible to work once they have received their Green Card. ?All Form I-929 applications are sent to the USCIS Vermont Service Center. ?There is a filing fee for the Form I-929. If you are unable to pay the fee, you may request a fee waiver by also filing a Form I-912, or by submitting a separate written request for a fee waiver.